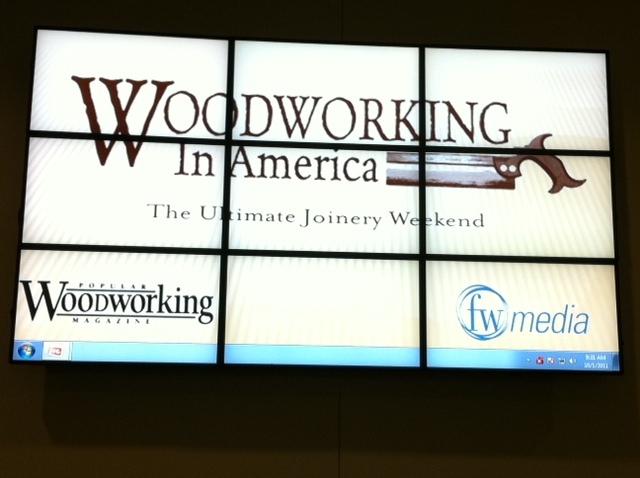 Picking up from an earlier blog here’s a bit more detail on Woodworking In America (WIA) 2011 and some examples of the seminars that were held. The quality of your work and your ability to do good work depends on the condition of your tools. It’s important for craftsmen (and women) to keep their tools sharp. Ron demonstrated simple and proper file techniques for the accurate sharpening of both rip and cross-cut saws. The methods were effective and straight forward. A novice could use his techniques and get great results. 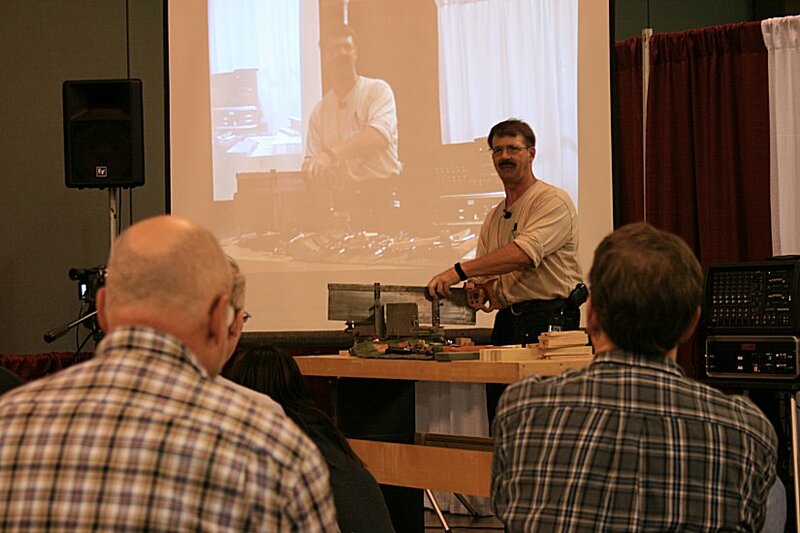 Here’s a short intro video by Ron about saw sharpening. Ron Herman is a master housewright. He specializes in the restoration of heritage homes using traditional hand tool methods. A shooting board is a workshop appliance that is used to trim end grain on moldings and trim to perfect angles of either 45 or 90 degrees. Ron discussed the use of shooting boards and how to simply construct a shooting board (aka a jig) to allow you to bring you more precision to your work. He gave a number of useful tips and tricks as well as techniques for using handplanes for shooting perfect miters (a miter joint is one where each side of the joint is cut at 45 degrees). Ron had a very good rapport with the audience. His sense of humour and his simple, no-nonsense approach to the subject backed up with years of practical experience made for a very entertaining and enlightening seminar. Jay was inspired to become involved in Japanese woodworking after seeing a demonstration by a Japanese tea house builder in the 1970’s. If you want to learn more about Japanese joinery have a look at this video. Jay is very knowledgeable. His presentation incorporated information on Japanese culture and how the tools were developed and why they work so well compared western designs. Did you know western planes cut on the ‘push’ stroke while Japanese planes cut on the ‘pull’ stroke. Jay provided information on both the construction and use of Japanese tools and he gave advice on how to use these tools to produce excellent results. Japanese joinery is much more precise than western joinery. It is designed to hold together without the use of any adhesives. Jay showed a number of finished examples and he cut some other joints to demonstrate the intricacy and precision that the Japanese bring to their craft. Have you heard enough about WIA? There are pictures of tools and toolmakers present in the ‘marketplace’ at WIA-would seeing some of that be of interest? I have a blog site but I do not do woodwork. My husband enjoys woodworking as a hobby but does not have a blog site. 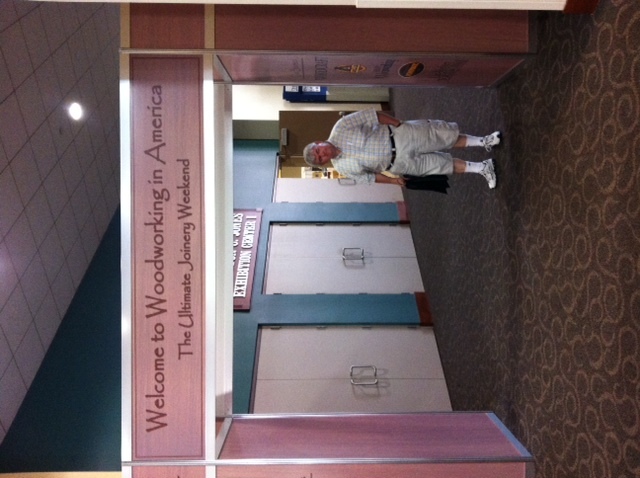 He recently attended the Woodworking In America (WIA) conference in Covington, KY and we decided we’d blog about it. 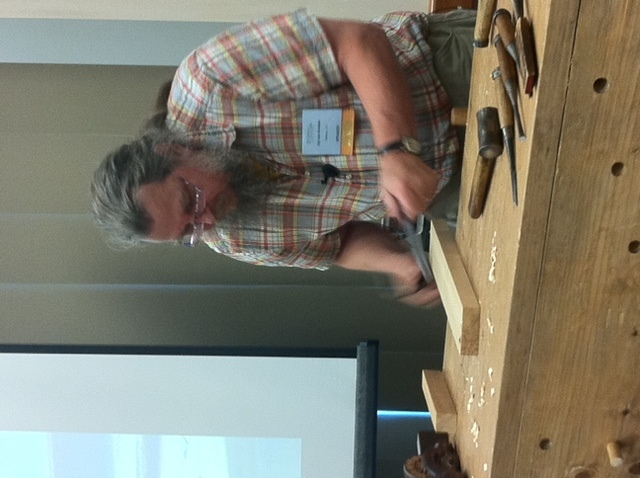 What: Once a year hand tool ‘galoots’ from all over flock to the WIA conference. This year was the fourth annual get together. Galoots is the term used to describe those who pursue the craft of woodworking solely with hand tools. (Editor’s note: Beats me why someone would want to be called a galoot.) Dedicated hobbyists, craftspeople (there were a very few women at WIA) gather for 2 1/2 days of seminars, demonstrations and to drool as they toured the 20,000 sq, ft, marketplace of exhibitors. 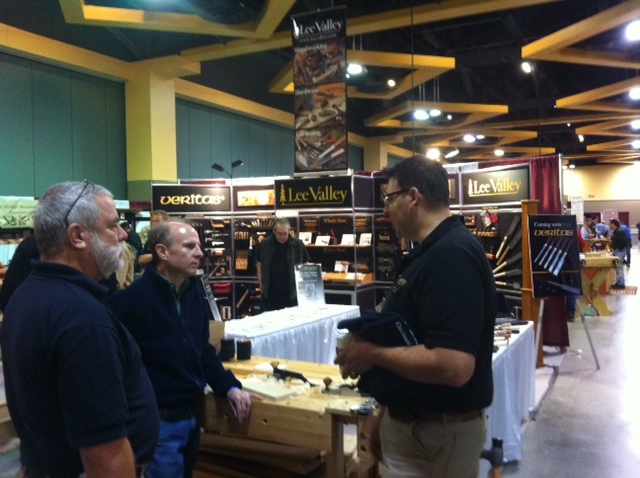 Why: To learn from the who’s who in hand-tool woodworking-to be clear, this is not carpentry. It is the world of hand cut mortice and tenons and smooth planed surfaces, of inlaid wood and carved contours. It’s an opportunity to meet craftspeople and tool makers that previously you would only have read about and chance to meet others who share the same passion. Let us know what you think about this joint (hah!) effort about joinery. 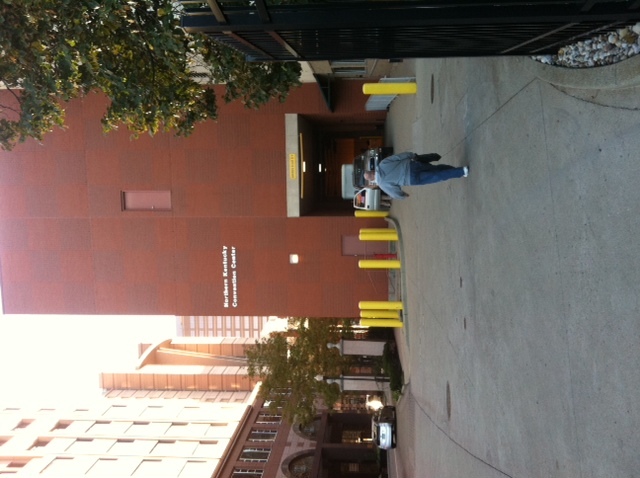 We will post one or more blogs to describe some of the classes and seminars. Would you like to hear about anything in particular when we write the blogs?